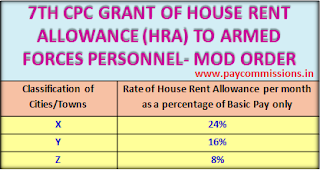 Subject: Implementation of 7th CPC Recommendations for grant of House Rent Allowance (HRA) to Armed Forces Personnel. 2. 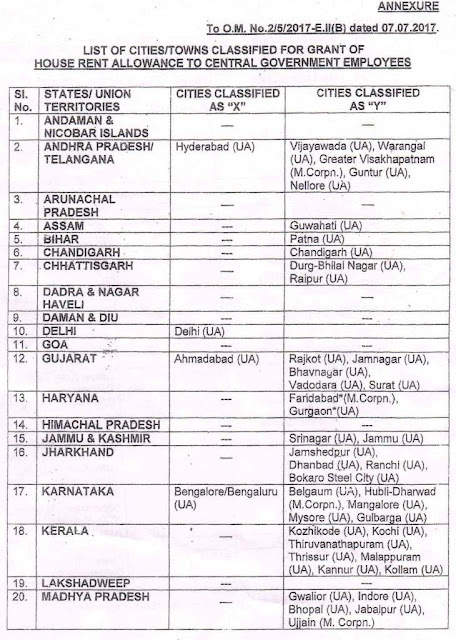 The list of cities/towns classified as X,Y and Z vide Ministry of Finance, Dept. of Expenditure OM No. 2/5/2017-E.II(B) dated 7th July, 2017 for the purpose of grant of HRA is enclosed as Annexure to these orders. 3. 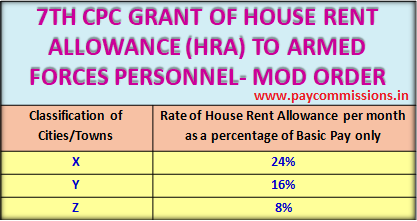 The rates of HRA will not be less than Rs. 5400/-, 3600/- & 1800/- at X, Y & Z class cities respectively. 4. The rates of HRA will be revised to 27%, 18% and 9% for X, Y & Z class cities respectively when Dearness Allowance (DA) corsses 25 percent and further revised to 30%. 20% and 10% when DA crosses 50%. 5. The term "basic pay" in the revised pay structure means the pay drawn in the prescribed pay levels in the Pay Matrix and does not include Non-Practising Allowance (NPA), Military Service Pay (MSP) etc. or any other type of pay like special pay etc. 6. Special orders on continuance of HRA at Delhi ('X' class city) rates to Central Government employees posted at Faridabad, Ghaziabad, NOIDA and Gurgaon, at Jalandhar (` Y' class city) rates to Jalandhar Cantt. at "Y" class city rates to Shillong, Goa & Port Blair and HRA at par with Chandigarh ('Y' class city) to Panchkula. S.A.S. Nagar(Mohali) which have been allowed to continue vide Para '4' of MoF O.M. No. 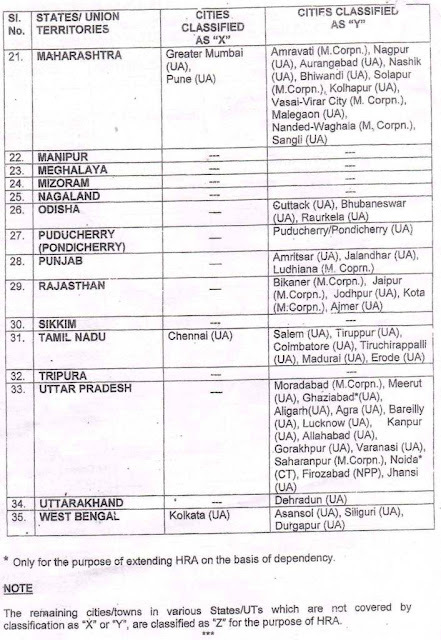 2/5/2014-D.II(B) dated 21.07.2015 and O.M. No. 2/2/2016-E.II(B) dated 03.02.2017, shall continue till further orders. 7. Other terms and conditions governing HRA to Armed Forces will remain unchanged. 8. The allowances relating to CILQ. FAA and SNLQ henceforth stand abolished as a separate allowance. Eligible employees to be governed by the newly proposed provisions for Housing for Personnel Below Officers Rank (PBORs). 9. The revised rates of the above allowances will be effected from 1st July, 2017. 10. This issues with the concurrence of the Ministry of Defence (Finance/Works) vide their ID No. 363/Fin/W-III/17 dated 10.10.2017.